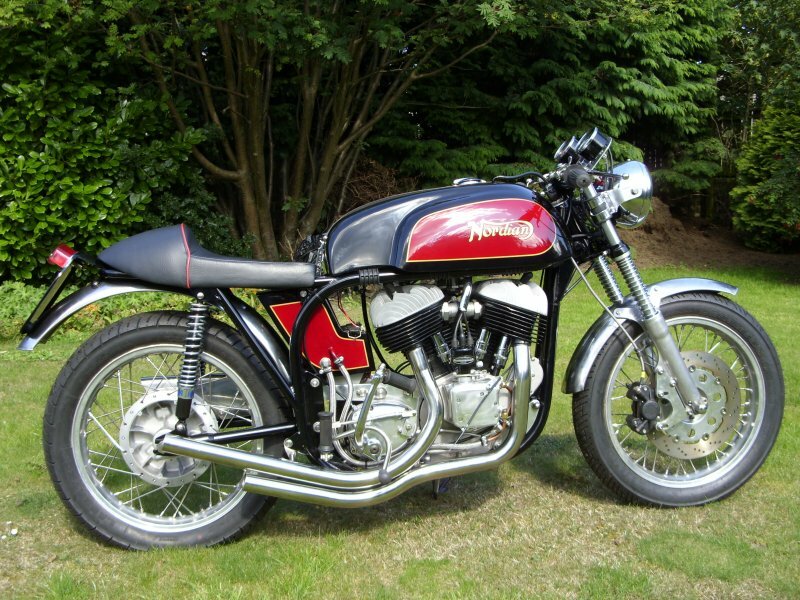 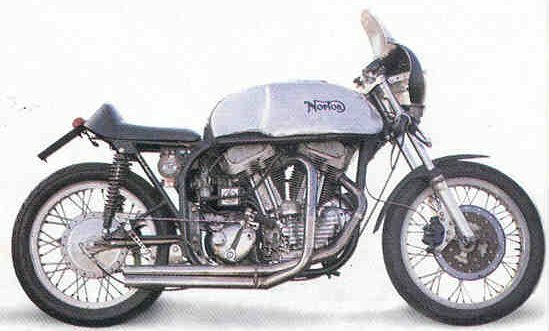 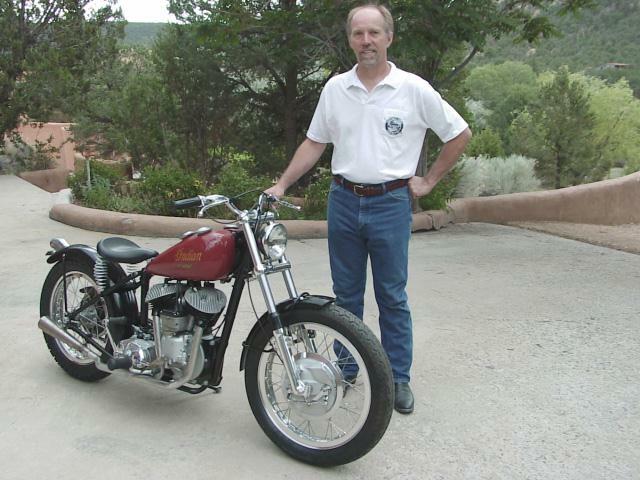 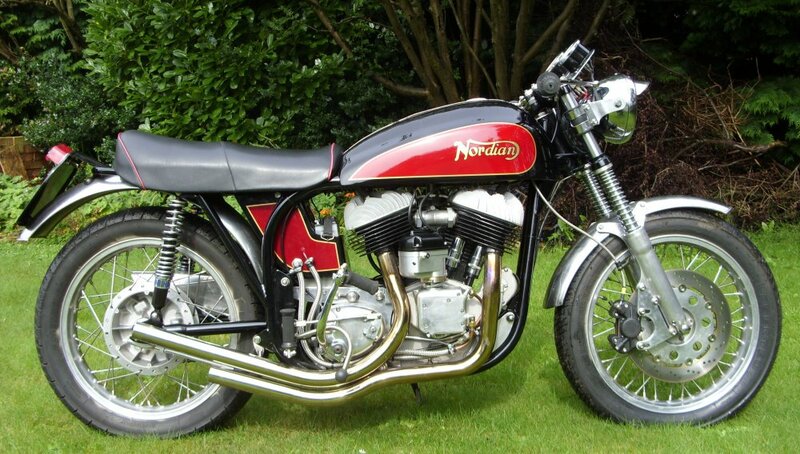 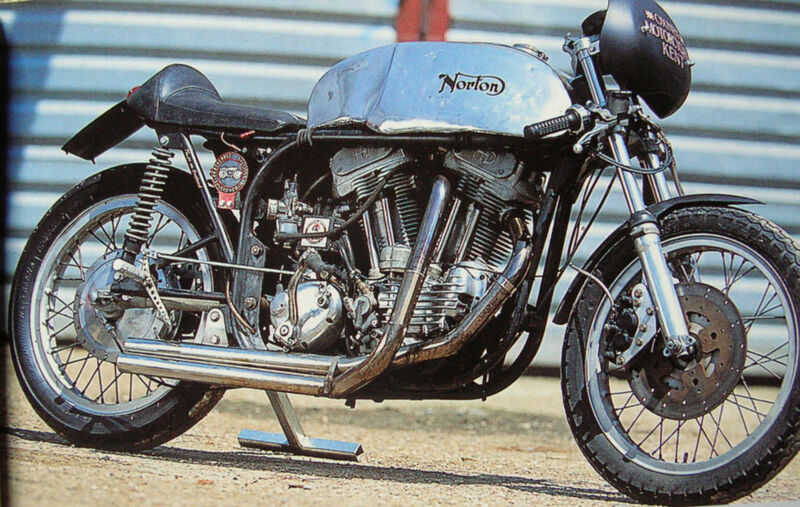 NORDIAN: Neil Grieve built this Indian-powered Norton, called the "Nordian"
The motor is an 84-inch (1376 cc) Indian V-twin. 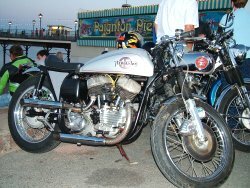 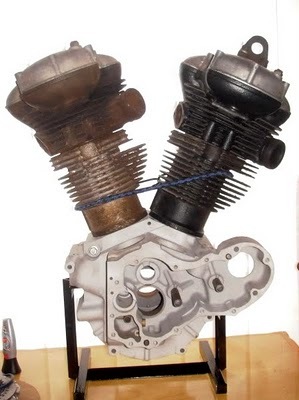 The engine is a re-engineered new item from Kiwi Indian, who make repro flathead Indians: http://www.kiwiindian.com and uses cams designed for Bonneville salt flats speed records.... the bike uses Mikuini carbs; the frame is a Norton Featherbed; the gearbox is Norton. 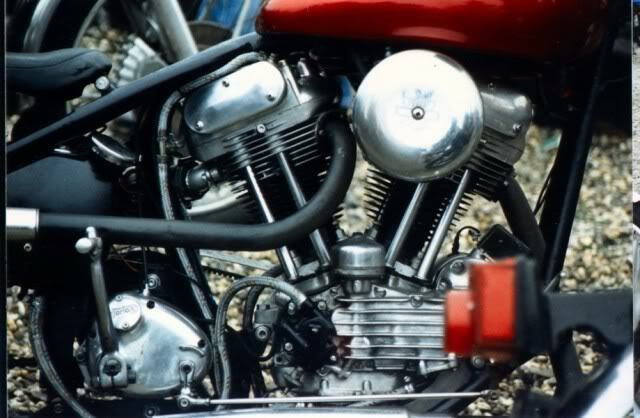 The primary drive is belt drive, and ignition is by Lucas alternator. 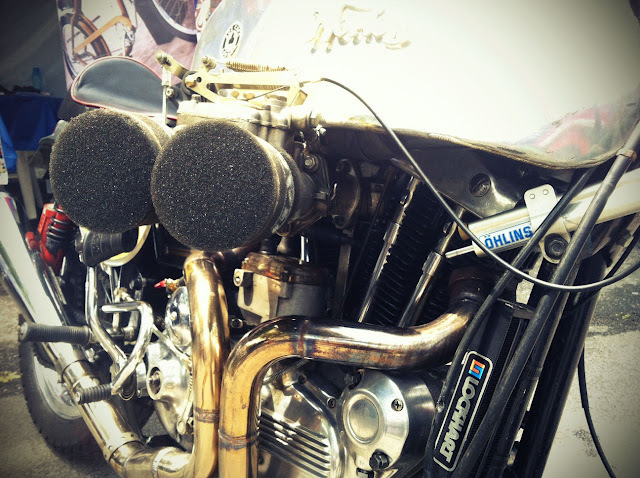 "NORTO" Cosmas Lili Sudrajat from Java, Indonesia built this Harley-engined special. 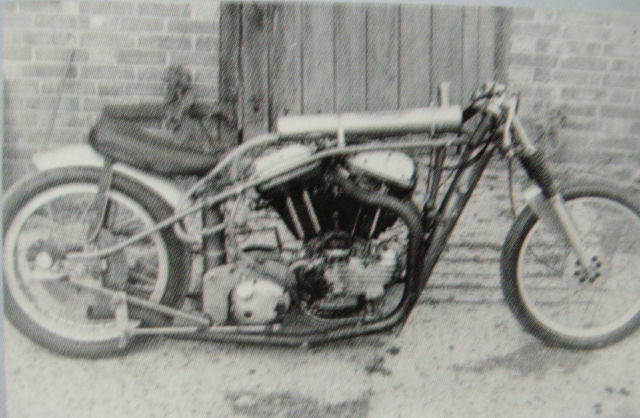 Modified Harley frame with handmade 1929 Norton-style tank; handmade BSA GolenFlash-style mudguards. 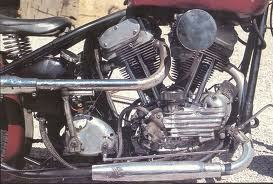 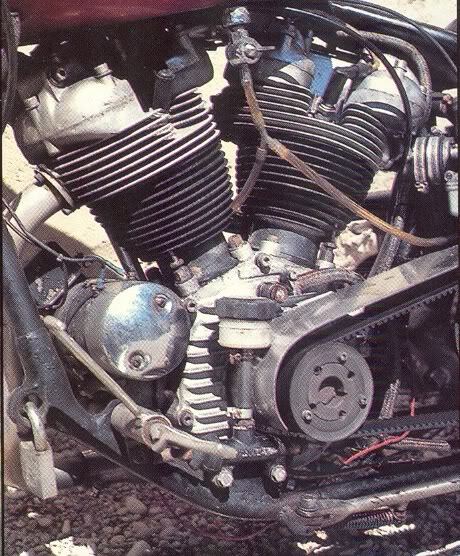 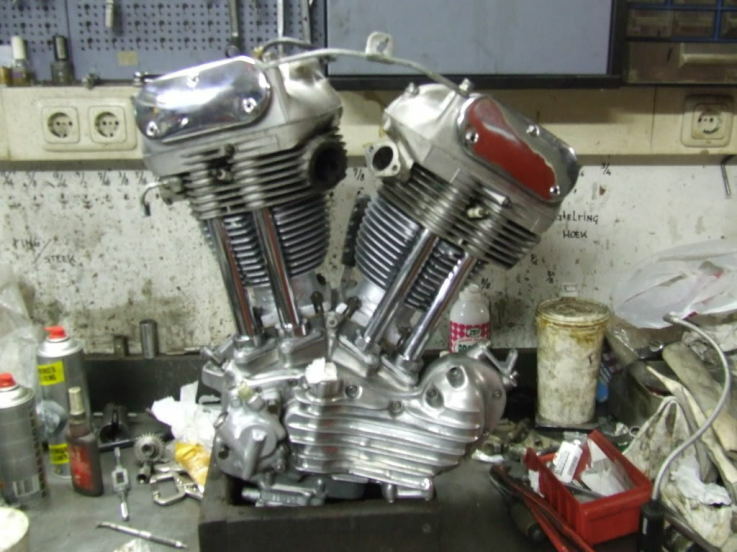 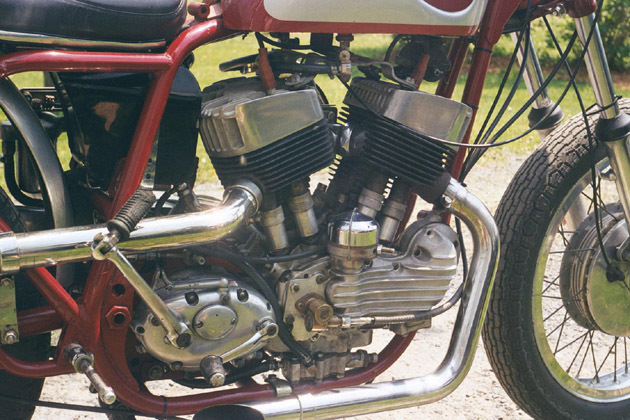 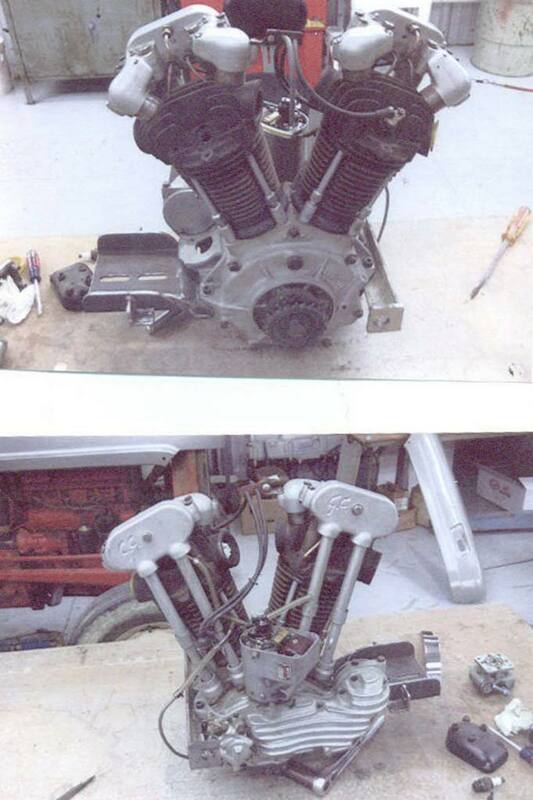 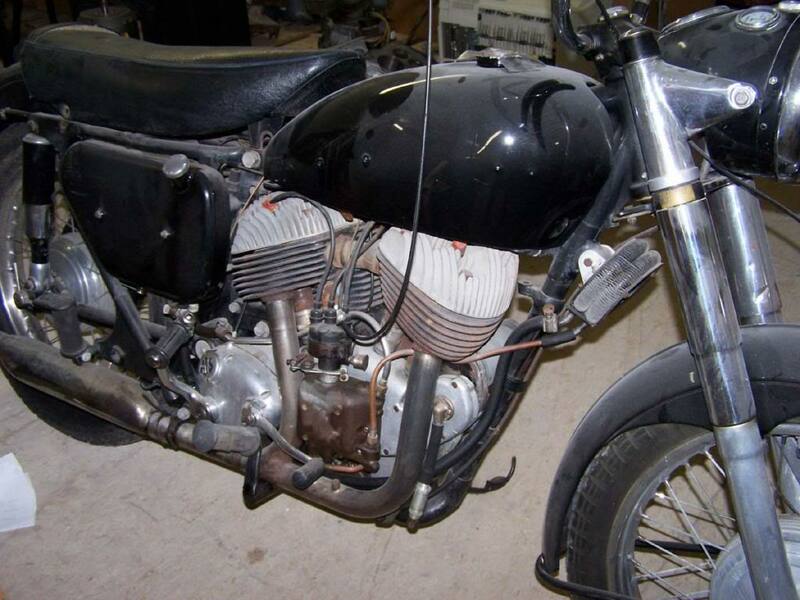 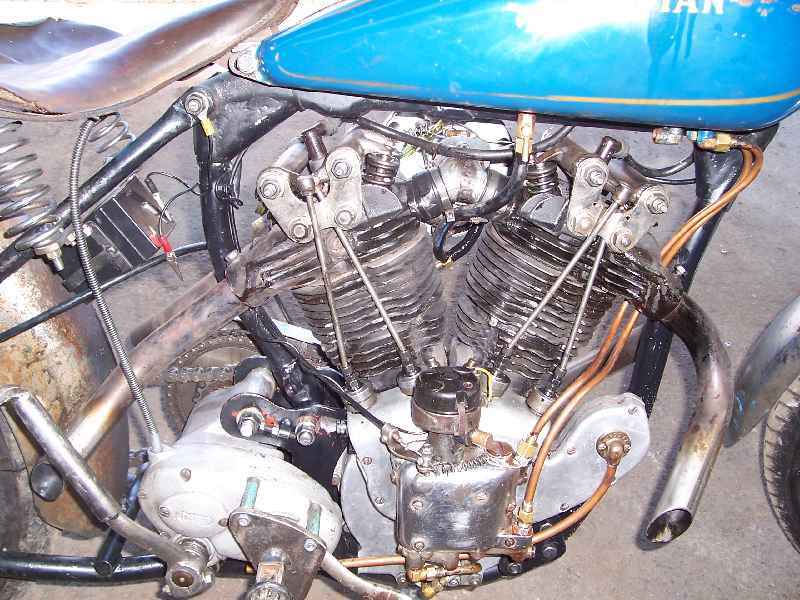 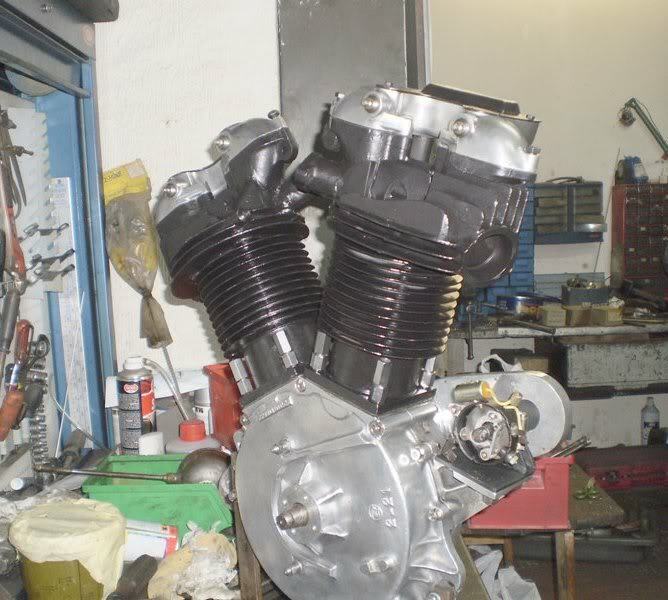 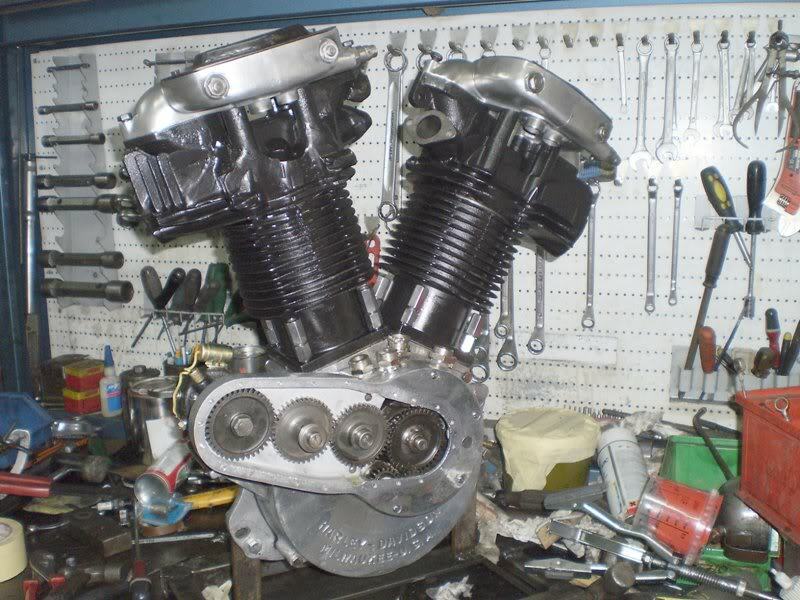 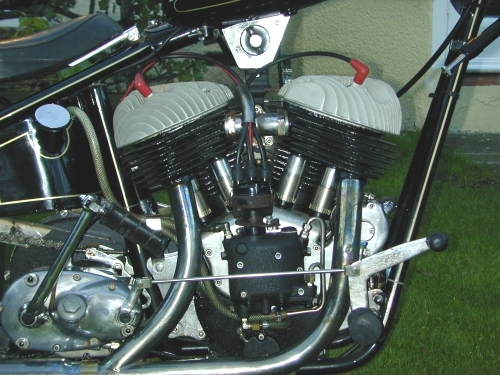 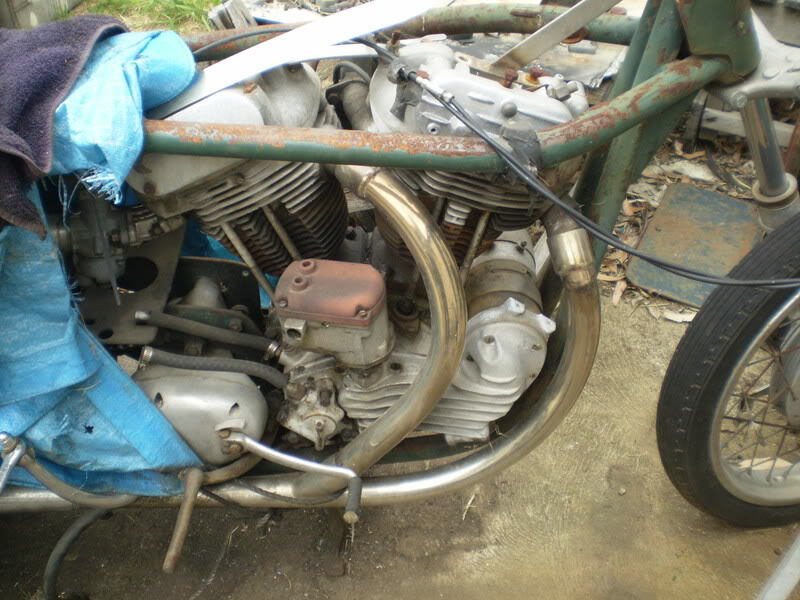 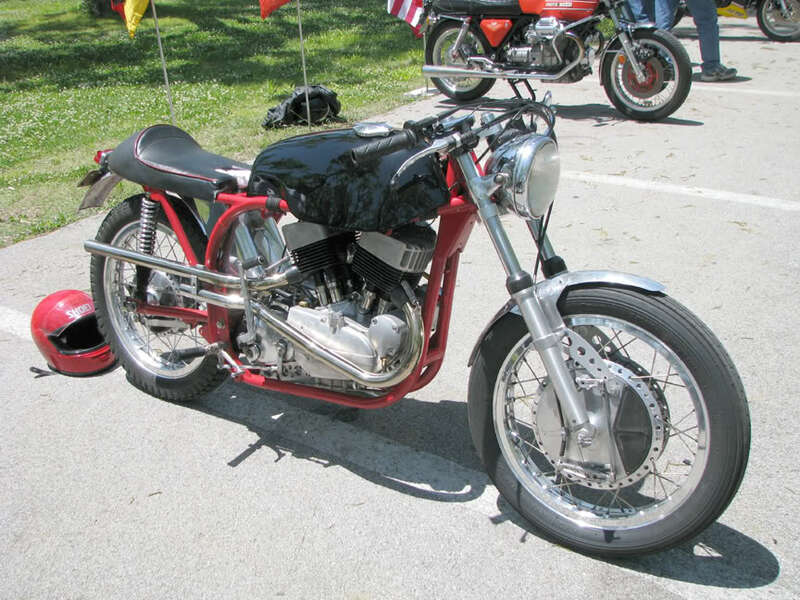 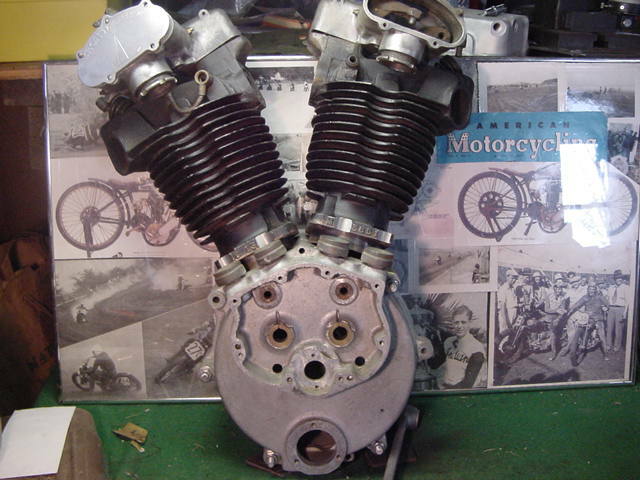 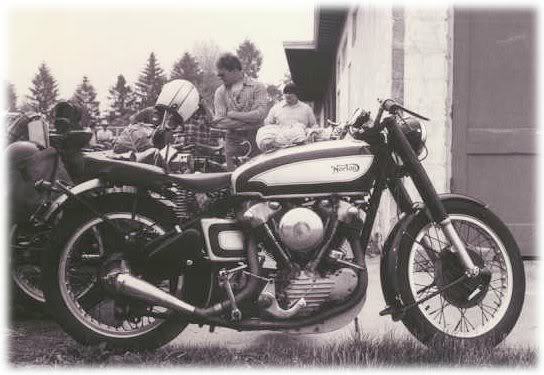 A Vincent engine in an Indian Chief frame with 1950-53 forks. 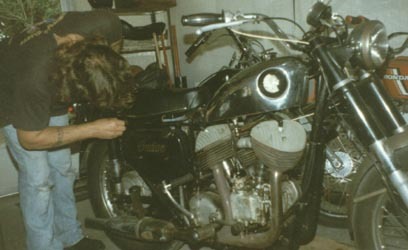 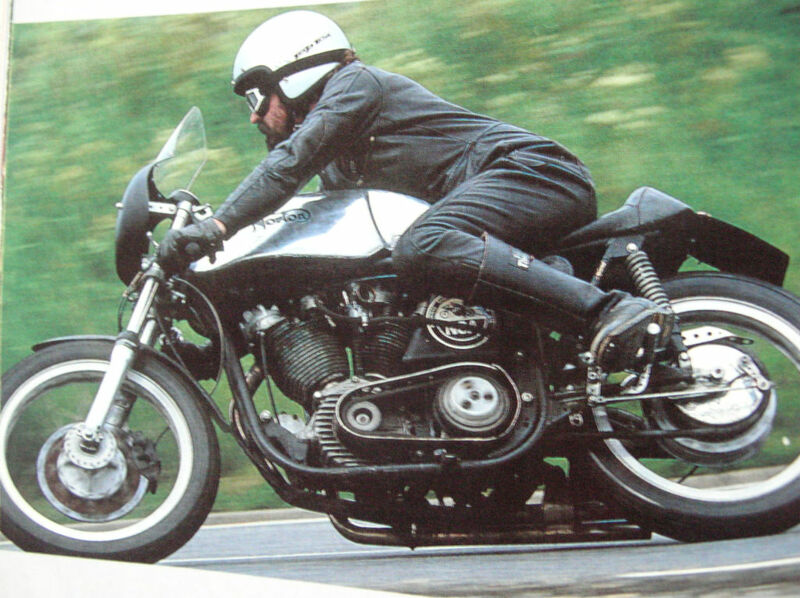 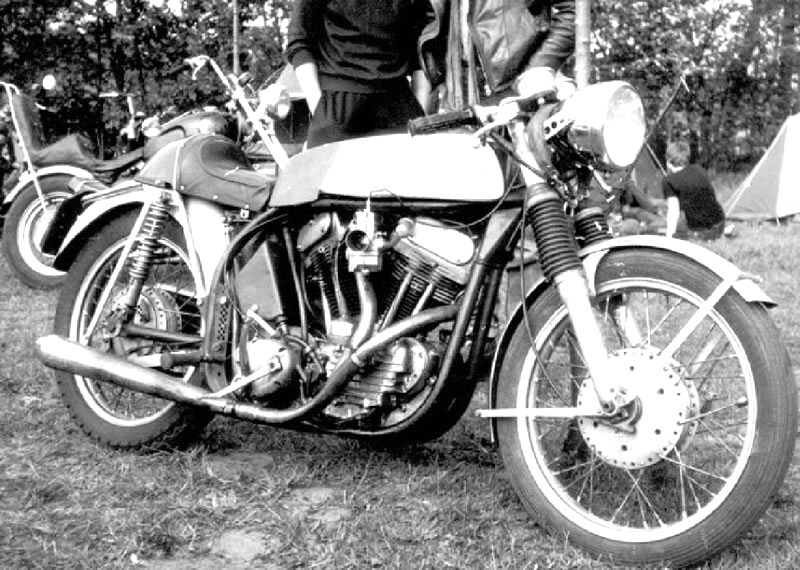 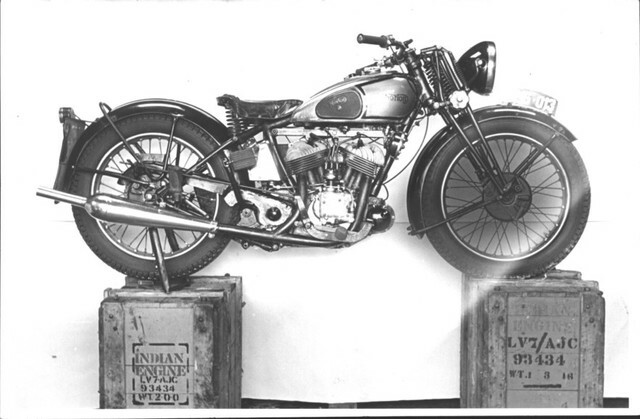 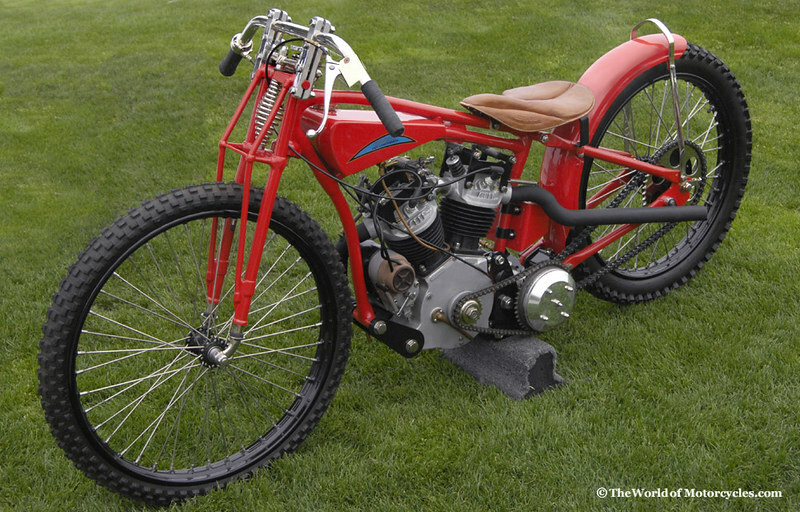 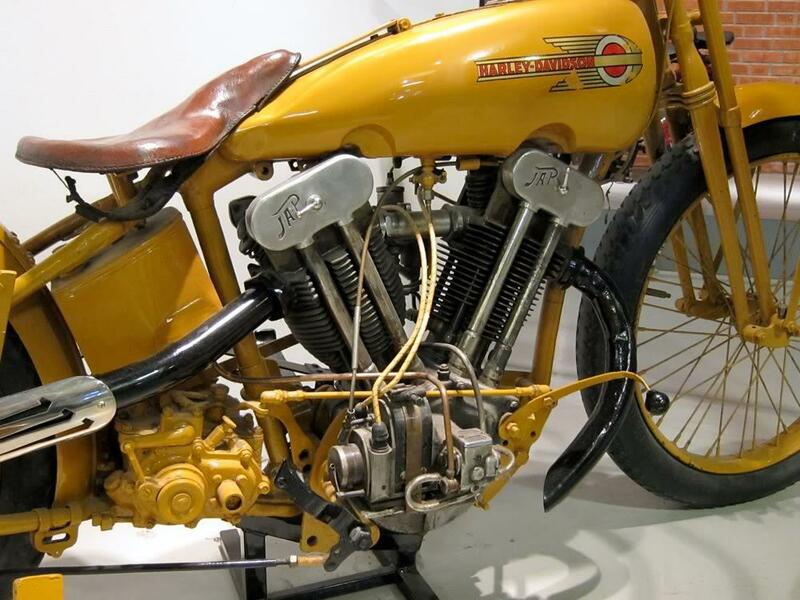 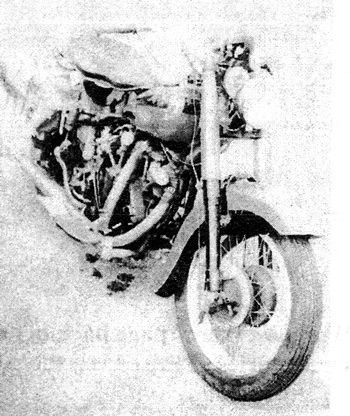 Indian Chief engine in an AJS rolling chassis - "an actual prototype built in England as an idea to reintroduce Indian Vtwins.". 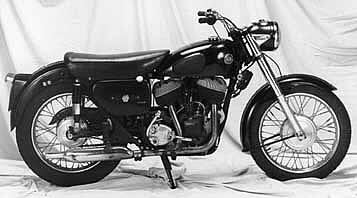 Built in 1957, other sources say it was made in USA. 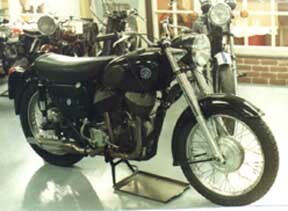 See links at the end of this section. 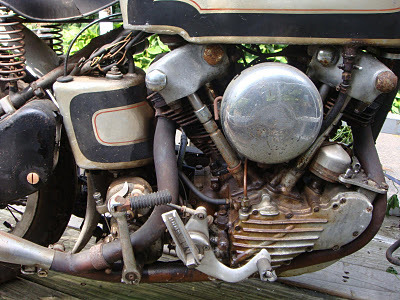 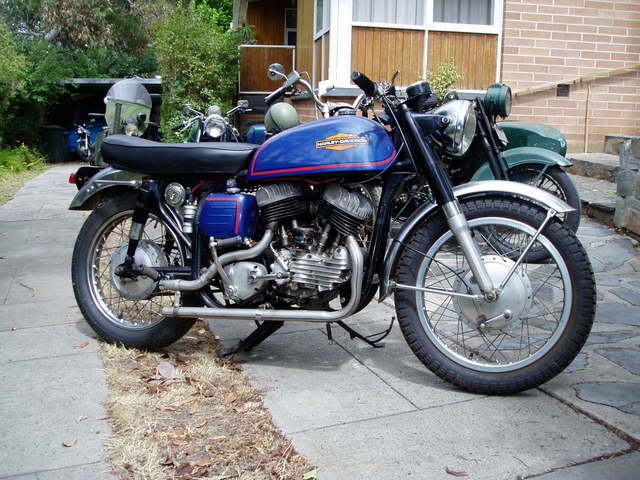 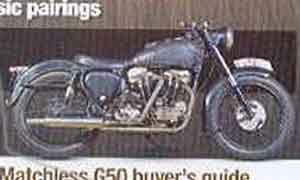 It has a 1947 Indian Chief engine and was built in 1960....owned by Indian Don...shame about the mudguards. 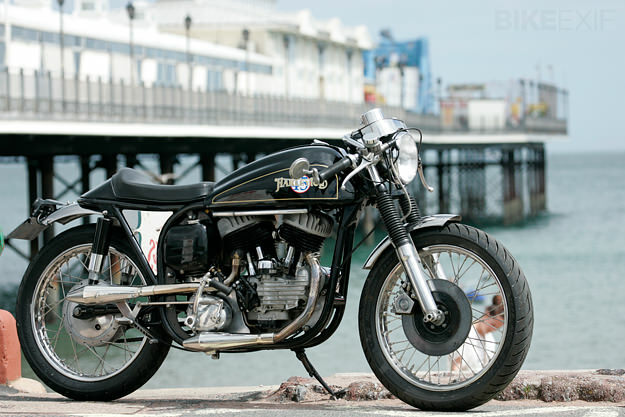 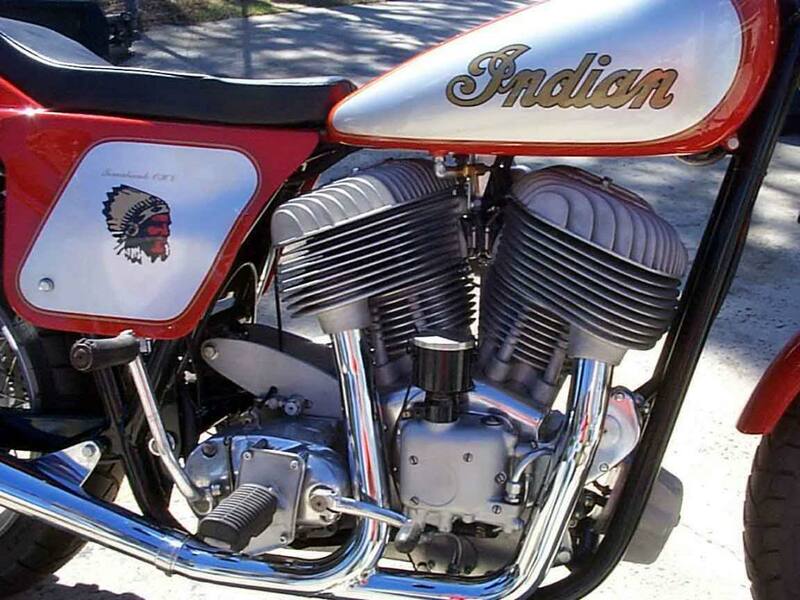 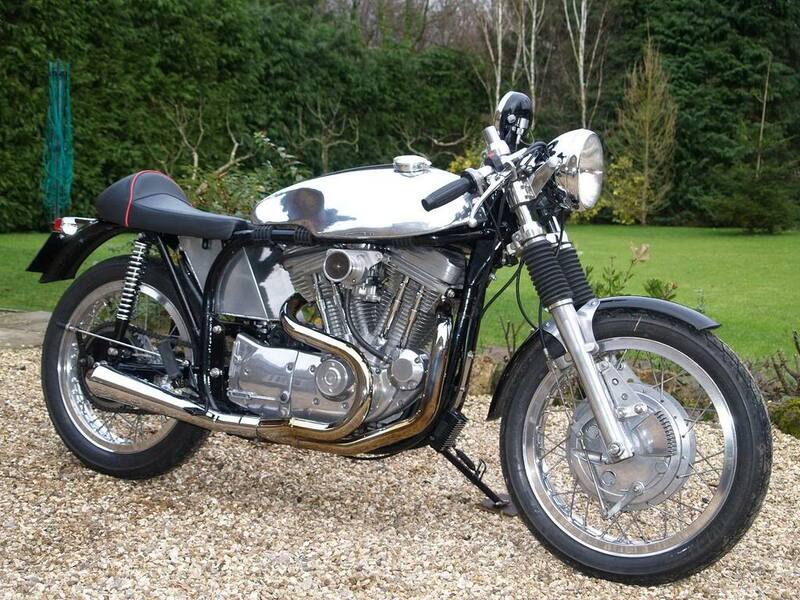 ..and an Indian Chief in a Norton Featherbed frame. 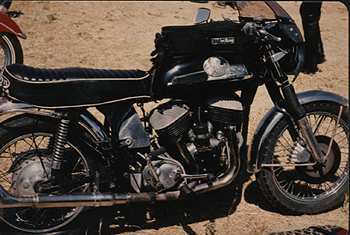 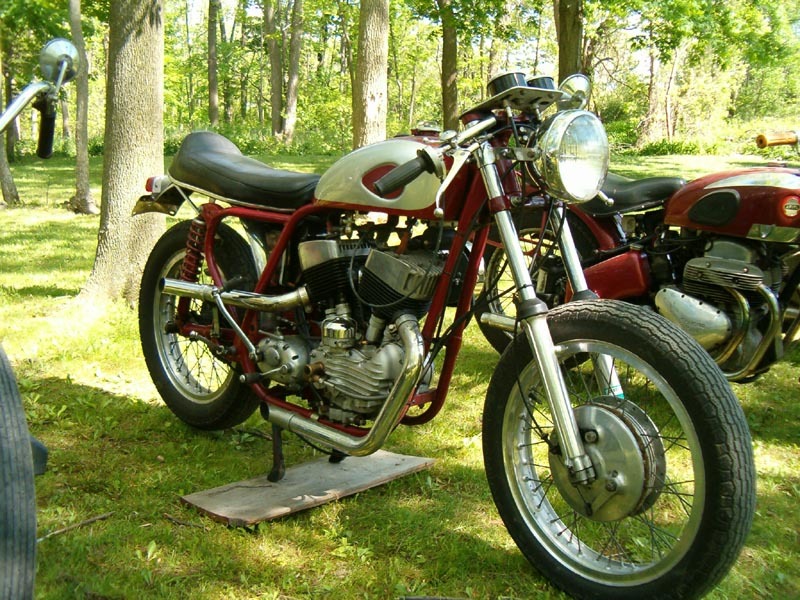 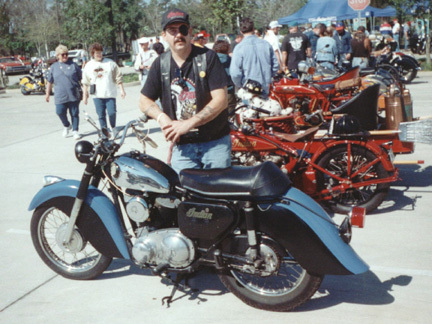 Triumph 650 frame; Triumph 500 Speed Twin rear frame; BSA mudguards; Triumph wheels; Indian Scout 58-inch "Stroker Super Scout" engine and narrowed Scout fuel tanks. 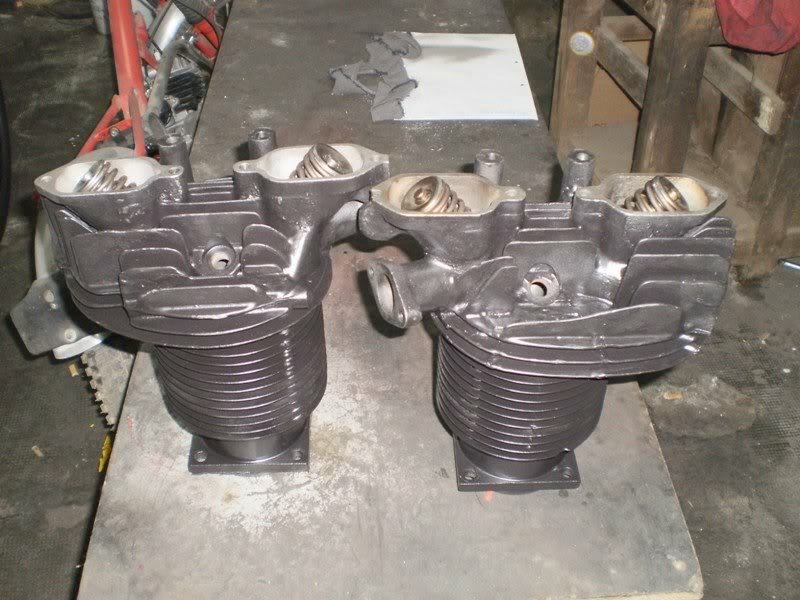 Dry weight 330 lbs. 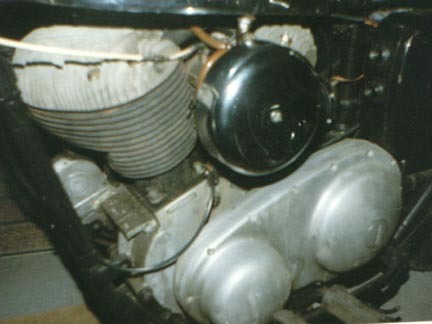 Crocker engine - a 1939 61-cubic inch big twin (the design was inspired by the BSA Y-13) - in a pre-WWII rigid Triumph frame, plus Triumph front end and transmission, with an Ariel tank (note heavily modified downtube). 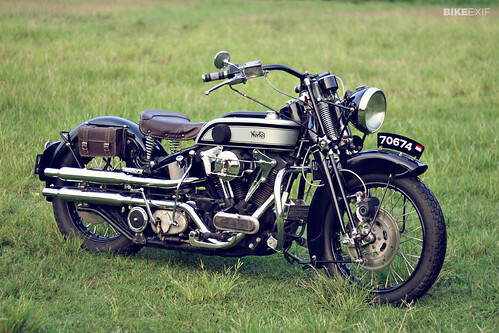 Crocker in a 1920 Rudge frame. 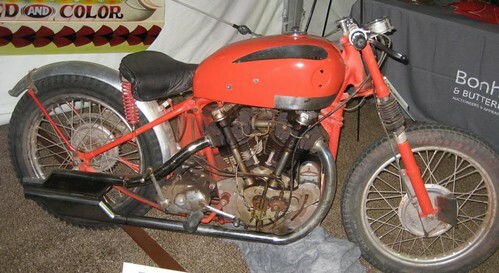 A JD Harley Davidson from the 1920s, with BSA Empire Star heads and modified rocker boxes (circa 1938). 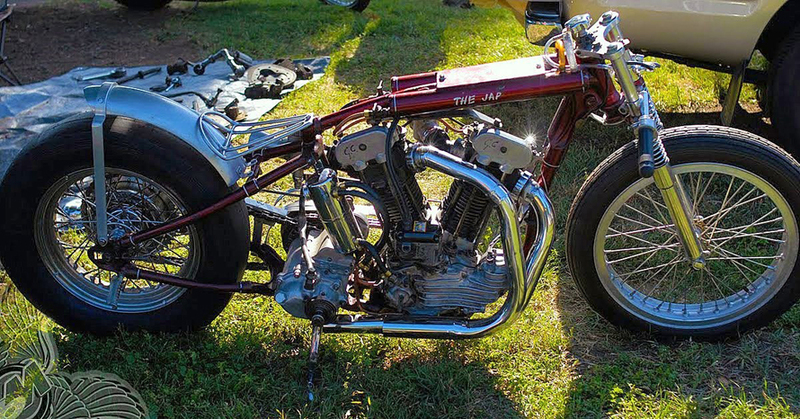 The barrels may be trimmed JD barrels. 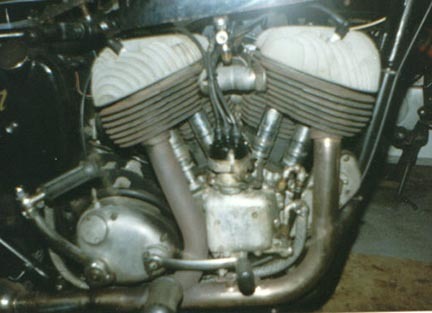 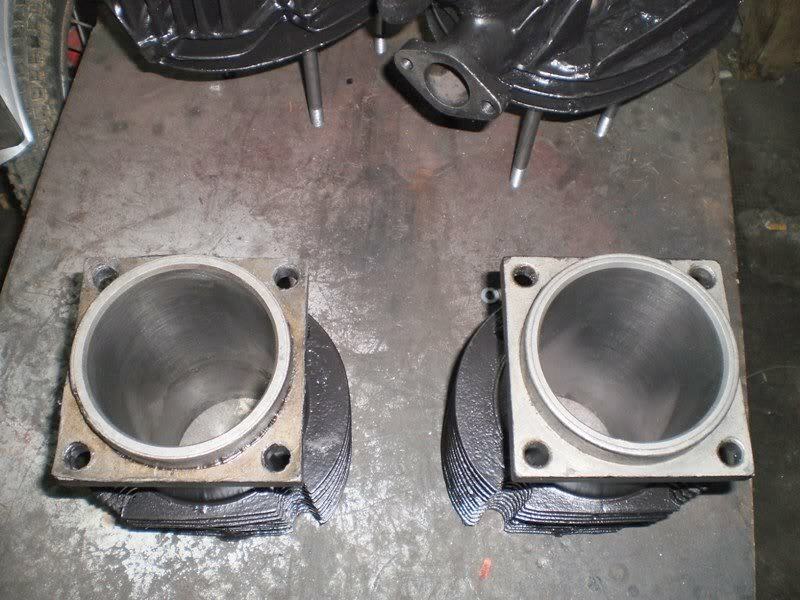 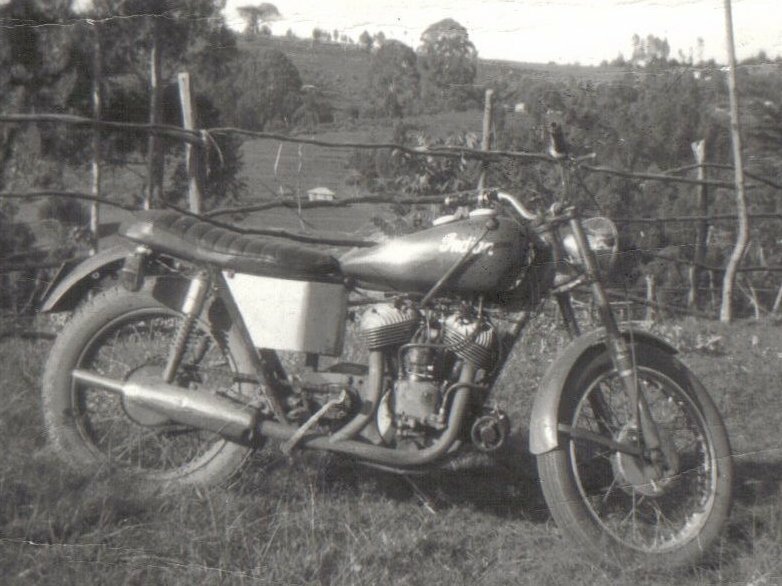 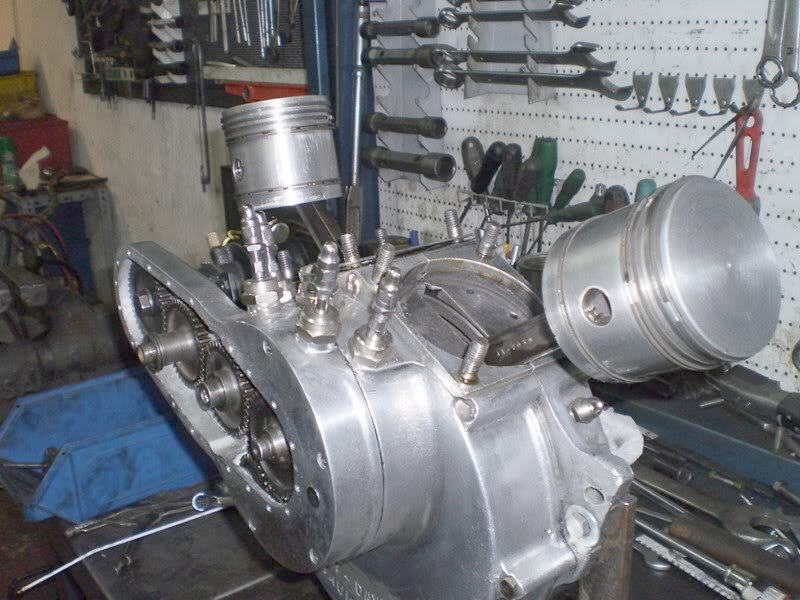 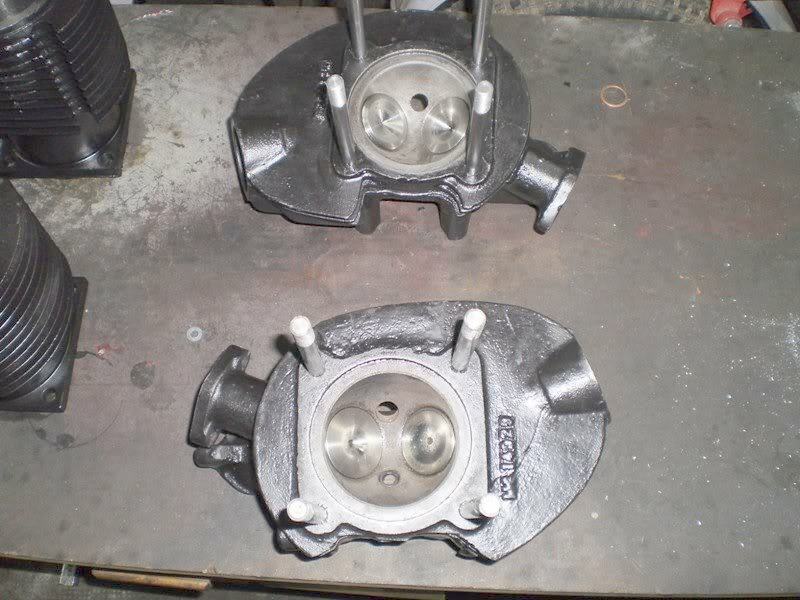 980cc K top end on a 45 bottom end, with a BSA A10 frame and gearbox.